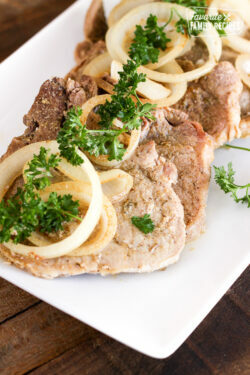 Cuban Style Crock Pot Pork Chops are savory with a slightly citrus twist. Slowly simmered all day, these tender pork chops make even an ordinary weeknight special! Place the pork chops in the pan and sear on 1 side until brown. Flip over sear until brown. Remove chops and place in crock pot (slow cooker). Add onion and garlic to pan and saute for 1-2 minutes, add onion/garlic to crock pot with the pork. Combine orange juice, lime juice, vinegar, and chicken broth and pour over the pork in the crock pot. Cover and cook for 45 min - 1 hour on high heat or 2 hours on low heat. Check for doneness depending on the size of the chops. They may need more time in the crock pot if they are bigger pork chops. Don't keep them in the crock pot too long or they will dry out. Pour remaining liquid over the chops when ready to eat. Garnish with the slow-cooked onions and tomatoes and/or avocado. Enjoy!